In this article we will discuss the differences between several methods of the Session interface: save, persist, update, merge, saveOrUpdate. This is not an introduction to Hibernate and you should already know the basics of configuration, object-relational mapping and working with entity instances. For an introductory article to Hibernate, visit our tutorial on Hibernate 4 with Spring. Quick guide to deleting an entity in Hibernate. This article shortly discusses how to call store procedures from Hibernate. Learn how to map entity identifiers with Hibernate. The Session interface has several methods that eventually result in saving data to the database: persist, save, update, merge, saveOrUpdate. To understand the difference between these methods, we must first discuss the purpose of the Session as a persistence context and the difference between the states of entity instances in relation to the Session. We should also understand the history of Hibernate development that led to some partly duplicated API methods. Apart from object-relational mapping itself, one of the problems that Hibernate was intended to solve is the problem of managing entities during runtime. The notion of “persistence context” is Hibernate’s solution to this problem. Persistence context can be thought of as a container or a first-level cache for all the objects that you loaded or saved to a database during a session. The session is a logical transaction, which boundaries are defined by your application’s business logic. When you work with the database through a persistence context, and all of your entity instances are attached to this context, you should always have a single instance of entity for every database record that you’ve interacted during the session with. In Hibernate, the persistence context is represented by org.hibernate.Session instance. For JPA, it is the javax.persistence.EntityManager. When we use Hibernate as a JPA provider and operate via EntityManager interface, the implementation of this interface basically wraps the underlying Session object. However, Hibernate Session provides a richer interface with more possibilities so sometimes it is useful to work with Session directly. detached — this instance was once attached to a Session (in a persistent state), but now it’s not; an instance enters this state if you evict it from the context, clear or close the Session, or put the instance through serialization/deserialization process. Here is a simplified state diagram with comments on Session methods that make the state transitions happen. When the entity instance is in the persistent state, all changes that you make to the mapped fields of this instance will be applied to the corresponding database records and fields upon flushing the Session. The persistent instance can be thought of as “online”, whereas the detached instance has gone “offline” and is not monitored for changes. This means that when you change fields of a persistent object, you don’t have to call save, update or any of those methods to get these changes to the database: all you need is to commit the transaction, or flush or close the session, when you’re done with it. Hibernate was the most successful Java ORM implementation. No wonder that the specification for Java persistence API (JPA) was heavily influenced by the Hibernate API. Unfortunately, there were also many differences: some major, some more subtle. To act as an implementation of the JPA standard, Hibernate APIs had to be revised. Several methods were added to Session interface to match the EntityManager interface. These methods serve the same purpose as the “original” methods, but conform to the specification and thus have some differences. It is important to understand from the beginning that all of the methods (persist, save, update, merge, saveOrUpdate) do not immediately result in the corresponding SQL UPDATE or INSERT statements. The actual saving of data to the database occurs on committing the transaction or flushing the Session. The mentioned methods basically manage the state of entity instances by transitioning them between different states along the lifecycle. 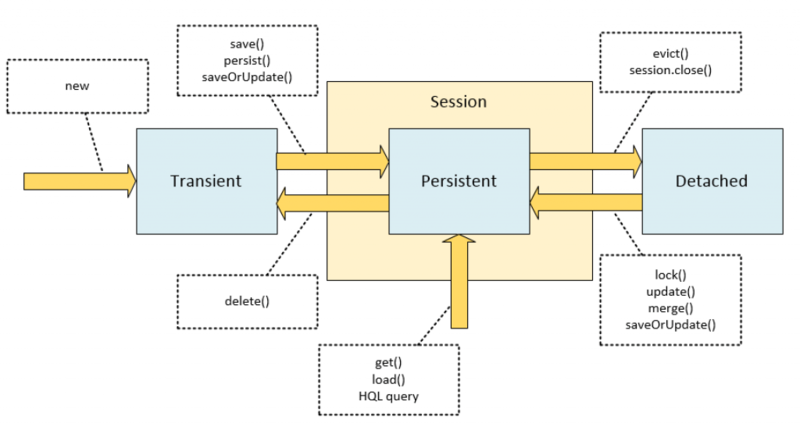 The persist method is intended for adding a new entity instance to the persistence context, i.e. transitioning an instance from transient to persistent state. What happens after the persist method is called? The person object has transitioned from transient to persistent state. The object is in the persistence context now, but not yet saved to the database. The generation of INSERT statements will occur only upon commiting the transaction, flushing or closing the session. Notice that the persist method has void return type. It operates on the passed object “in place”, changing its state. The person variable references the actual persisted object. if an instance is detached, you should expect an exception, either upon calling this method, or upon committing or flushing the session. Notice that there is nothing here that concerns the identifier of an instance. The spec does not state that the id will be generated right away, regardless of the id generation strategy. The specification for the persist method allows the implementation to issue statements for generating id on commit or flush, and the id is not guaranteed to be non-null after calling this method, so you should not rely upon it. The save method is an “original” Hibernate method that does not conform to the JPA specification. Its purpose is basically the same as persist, but it has different implementation details. The documentation for this method strictly states that it persists the instance, “first assigning a generated identifier”. The method is guaranteed to return the Serializable value of this identifier. The id2 variable will differ from id1. The call of save on a detached instance creates a new persistent instance and assigns it a new identifier, which results in a duplicate record in a database upon committing or flushing. The main intention of the merge method is to update a persistent entity instance with new field values from a detached entity instance. For instance, suppose you have a RESTful interface with a method for retrieving an JSON-serialized object by its id to the caller and a method that receives an updated version of this object from the caller. An entity that passed through such serialization/deserialization will appear in a detached state. In the following example we evict (detach) the saved entity from context, change the name field, and then merge the detached entity. Note that the merge method returns an object — it is the mergedPerson object that was loaded into persistence context and updated, not the person object that you passed as an argument. Those are two different objects, and the person object usually needs to be discarded (anyway, don’t count on it being attached to persistence context). if the entity is persistent, then this method call does not have effect on it (but the cascading still takes place). this method throws an exception if you pass it a transient entity. In the following example we save the object, then evict (detach) it from the context, then change its name and call update. Notice that we don’t put the result of the update operation in a separate variable, because the update takes place on the person object itself. Basically we’re reattaching the existing entity instance to the persistence context — something the JPA specification does not allow us to do. This method appears only in the Hibernate API and does not have its standardized counterpart. Similar to update, it also may be used for reattaching instances. You may think of this method as a universal tool for making an object persistent regardless of its state wether it is transient or detached. If you don’t have any special requirements, as a rule of thumb, you should stick to the persist and merge methods, because they are standardized and guaranteed to conform to the JPA specification. They are also portable in case you decide to switch to another persistence provider, but they may sometimes appear not so useful as the “original” Hibernate methods, save, update and saveOrUpdate. We’ve discussed the purpose of different Hibernate Session methods in relation to managing persistent entities in runtime. We’ve learned how these methods transist entity instances through their lifecycles and why some of these methods have duplicated functionality. The source code for the article is available on GitHub. If merge operation can save transient object what is the purpose of using persist operation? The merge operation does not make the passed object persistent, it always copies passed object onto another object in the persistence context. You actually can use only merge operation in your application, but that’s an important architecture decision: you’ll always have to discard the object passed to the merge operation. This means that if some components of your application hold on to this object, their reference has to be updated. So choosing between merge-only or persist+merge is a matter of architectural style. You use persist when you would like that the method creates a new entity and never updates an entity. In otherwise the method throws an exception about primary key uniqueness violation. In this case you handle entities in a stateful manner and can use gateway pattern. You use merge if you would like that the method either inserts or updates an entity in the database. In this case you handle entities in a stateless manner and can use data transfer objects in services. when does merge operation decide to save a object as new? so i think that first the merge operation will find a object in persist context if that hasn’t one it will find by query to sql to get it. if it not has too. merge operation will make object as a newly persist object?? If X is a detached entity, the state of X is copied onto a pre-existing managed entity instance X’ of the same identity or a new managed copy X’ of X is created. So, the answer is “yes”. Cheers!